Though I have never owned one, I have long had an interest in the Dreyse 9mm pistol. Recently I was pleased to receive from a friend a photo of the ammunition made for this pistol. I had previously seen the top label in a book published in German, and assumed because of its color, it was made by DWM. My friend’s photo included the end label which clearly identifies the ammunition as a product of Rheinische Metallwarren und Maschinenfabrik in Sommerda. 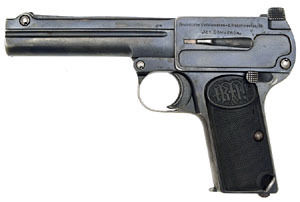 This is interesting, since Geoff Sturgess in his book with Joachim Görtz, The Borchardt & Luger Automatic Pistols, discusses the Prussian Gendarmerie trials of the Dreyse pistol and the Pistolen 08 in 1911. His translation of the trials report indicates that the Dreyse pistol suffered from 4 jams when firing 450 rounds of ammunition. The report goes on to say that the jams were caused by deformation of the case because the case material was too weak. 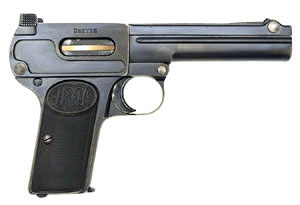 The Dreyse factory representatives indicated that they would produce their own ammunition for this pistol. The box illustrated is apparently the ammunition referred to in the trials report and may have been produced in conjunction with the Prussian order for 2700 weapons. The box illustrated above was empty when found, but the label indicates that the ammunition had a flat tip, truncated bullet and must date from about 1912 or 1913. Reinisch Mettallwarren und Maschinenfabrik ammunition (headstamp code “RM S”) production for the German army began in December 1916, based on the case date of the earliest known cartridges. 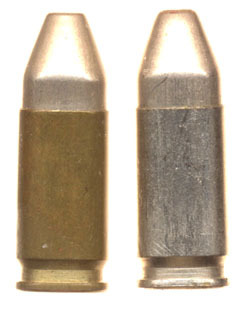 The “RM S” rounds with commercial style headstamps (similar to those illustrated below) were produced no earlier than 1916, based on the round-nose bullet style of the loads. Reinisch Mettallwarren und Maschinenfabrik cartridges loaded with truncated bullets are quite scarce, but are known in both ball and a plated case dummy, illustrated above. These both have commercial style headstamps so were never intended for the German Army. 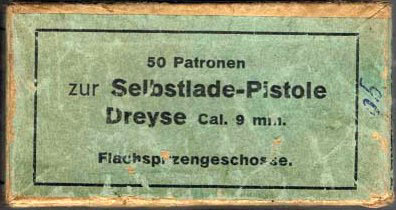 It is likely that the cartridges illustrated were originally intended for the Prussian order, but may have been sold later in conjunction with commercial sales of the Dreyse 9mm pistols. If and when I find a duplicate of the ball load illustrated above, I intend to disassemble it and see if the case is thicker near the base which would be one approach to solving the distortion found in the testing. Has anyone else seen a box of this Dreyse ammunition? Has anyone additional information on the production of this ammunition? Any information would be appreciated. Please write to me at gigconceptsinc@gmail.com. The Borchardt & Luger Automatic Pistols, by Joachim Görtz and Dr. Geoffrey Sturgess. Brad Simpson, Galesburg, IL: 2011. Copyright 2013 by Lewis Curtis. All rights reserved.